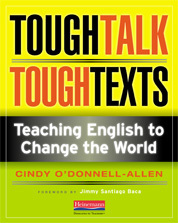 So…Tough Talk, Tough Texts is finally here! I’m super excited to report that one crashed hard drive, four editors, and a year behind expected publication date, the book is finally out! I’ll be talking about it soon on NWP Radio. We record tomorrow, and the show airs on Sept. 8, 4pm (that’s Pacific time, I think.) I’ll be on the show with Katherine Schulten from the New York Times Learning Network, Corey Harbaugh from the Third Coast Writing Project, and Jennifer Lemberg, NY Project Coordinator for the Holocaust Educators Network. We’ll all be talking about the kinds of support students and teachers need to tackle controversial subjects like 9/11. On that show, I mention some resources that you may want to access if you’re tuning into the show. I talk more about the focus of the book at the end of this message, but here are the resources I mention. Philbrick, Rodman. The Last Book in the Universe. Chambers, Aidan. Postcards from No Man’s Land. Haddon, Mark. The Curious Incident of the Dog in the Nighttime. Paton, Alan. Cry the Beloved Country. Chbosky, Steven. The Perks of Being a Wallflower. Evslin, Bernard. Heroes, Gods, and Monsters of the Greek Myths. Porter, Connie. Imani All Mine. Salinger, J. D. Catcher in the Rye. OTHER RESOURCES: On the Heinemann website, you can also find assignment sheets, scoring guides, and other resources for all the culminating projects I discuss in Ch. 6 of the book, “Assessing Civil Discourse: Using 21st-Century Skills to Leave No Text Behind.” Just click on the Companion Resources tab on Heinemann’s page describing the book. Finally, below is more about the purpose of the book. Listen in to the show if you want to know more! FOCUS OF THE BOOK: The book is based on the work I’ve done over a number of years with three teacher-researchers from the Colorado State University Writing Project: Cameron Shinn (then a 6th-grade teacher in a rural school), Rebecca Garrett (a 10th-grade pre-AP teacher in an affluent suburban school), and Beth Lewis (teacher of a multi-age English class in an alternative school). Together, we examined how kids engaged in civil discourse on literature containing controversial, but culturally significant topics like race, class, gender, war, religion, drug use, homosexuality, and the like. Our premise was that if kids can have productive conversations about these topics in the classroom, we will increase their chances of doing so beyond the classroom. In writing the book, I came to believe that this kind of critical reading, writing, and talk just might have the potential to change the world, especially since they certainly don’t have cultural role models who can help them out with this in our world today (case in point: the debt ceiling debacle just last month, and this month, and next month, ad nauseum). Thus the subtitle of the book: Teaching English to Change the World. I know that writing it changed me. I hope you’ll read it and see if you agree. This book looks great. I’m so glad to see WP folks publishing and doing inquiry work. Good luck! Cindy’s work is always thought provoking and worth exploring. She understands that teachers, just by virtue of our jobs, do change the world.The question we teachers must ask each day is HOW we will change the world. This book challenges us to build classroom curriculum that provides students with real opportunities to engage in productive conversations around difficult subjects. Helping teachers and students understand the value and power of civil discourse might just change the world as we know it!